I have a confession to make. I haven’t been cooking all that much lately. I mean really cooking. I find myself making side dishes or desserts for gatherings I’m invited to, omelets and salads for dinner, brown rice with sauerkraut, a quick zucchini soup, sliced tomatoes and mozzarella, you get the picture. This is all good food, but none of it takes much thought or is particularly inspired. I think we all have dry spells, but I don’t think most of us food-type people like to admit it. In truth, with a cookbook coming out in a month, it makes me feel like a fraud–especially when my friends are canning, cooking jam, and making moon pies with homemade marshmallows and graham crackers. That said, I do make sure that I sit down at the table and eat with a napkin, knife and fork, civilized-like–even if it is just brown rice and sauerkraut. Sometimes though, even in a dry spell, I’m inspired to have what I call a real dinner. Part of the inspiration for this meal was the opening of the Marin Sun Farms butcher shop at Market Hall in Rockridge. I don’t eat a lot of meat and when I do, I want to know where it came from and how it was raised. At Marin Sun Farms, there is no mystery meat. The excellent butchers there can tell you where the animal that became your lamb chop was raised (Petaluma). That’s lovely. I bought this nice little lamb chop and took it home to combine with the produce in my fridge. Dinner was simple and sublime. I made a quick little pesto in my mortar/pestle with anchovies, garlic, parsley and olive oil. I salt and peppered the lamb and seared it to medium rare. I served it with Massa duck-fat roasted fingerling potatoes from the farmers’ market, and some squash I grew myself that I steamed and smashed with butter, salt and pepper, and a little grated raw goat milk cheddar. 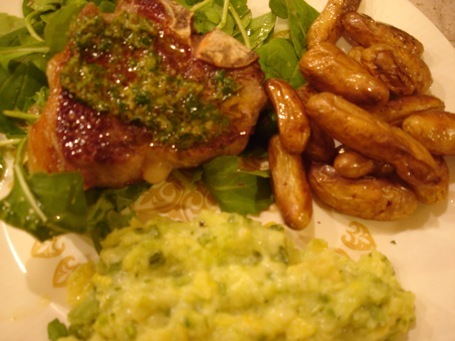 I topped the lamb with the pesto, and the pesto’s umami combined with the lamb’s natural savoriness was so delicious, it almost tasted like there was a truffle in there somewhere. It was a meal that made me moan with pleasure, and one I didn’t have to work that hard for. Now that’s what cooking should be. I hope that if you too are in a cooking rut, that this post has inspired you to go out and get the best ingredients you can and do the simplest thing you can think of with them. I promise it will be good. PS: Welcome to the new website. I’ve moved from having a static website and a Typepad blog to an all-in-one WordPress platform. I hope you like it. This is where you’ll find all the exciting DIY Delicious related events that are coming up soon! This entry was posted in Uncategorized, from the market and tagged DIY Delicious, duck fat, lamb, Marin Sun Farms, Market Hall, Massa Organics. Bookmark the permalink. Post a comment or leave a trackback: Trackback URL.